Syrian Ibrahim Jamal al-Jahamani, who was recently released from Syrian jail where he said he saw a 15-year-old boy tortured to death, speaks in an interview on the Syrian-Jordanian border on Thursday. 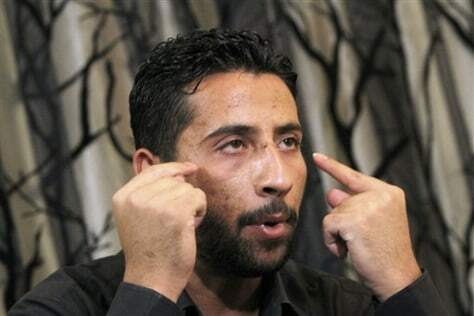 He points to his eyes, signaling that he saw the boy — Tamer Mohammed al-Sharei — beaten to death by his Syrian interrogators. Al-Sharei disappeared in the southern Syrian flashpoint town of Daraa on April 29, 2011.